You are here: Home › Garden design › Parterres & Knots – still relevant today? Parterres & Knots – still relevant today? • Comments Off on Parterres & Knots – still relevant today? Parterres and knot gardens date from the 16th century in France and England respectively and are usually associated with National Trust properties and other large country houses. 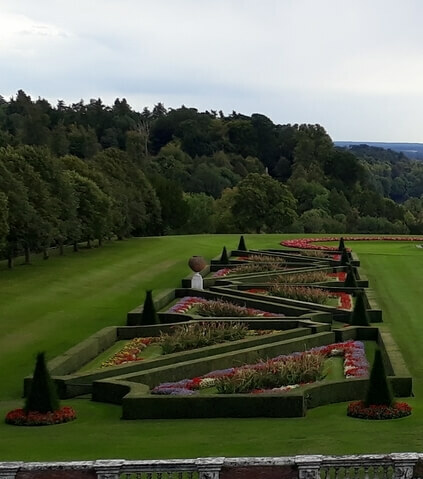 In fact the photograph shows one half of the impressive Parterre Garden at National Trust Cliveden House in Buckinghamshire However they have a lot to offer the modern gardener and with a little planning do not need armies of under gardeners for planting and maintenance. Clearly they are formal, with regular patterns marked out with evergreen dense low-growing shrubs, often Box but Lavender and Santolina are also used, and the gaps either spread with gravel (lay landscape fabric underneath to prevent weeds) or filled with low-growing flowers. The key is to measure the available space carefully and draw your design to scale on paper so that you are sure it fits and to estimate the number of plants needed. Knots are historically simpler and geometric, parterres full of swirling curves mimicking embroidery. The design depends on space, artistic talent and the style of your house if it is used as the backdrop. A modern house can support a strongly geometric and possibly asymmetrical layout; an old cottage would suit brick paths between Box partitions overflowing with informal flowers. The central planting can be permanent shrubs or plants to avoid the work of 2 or 3 bedding schemes each year, but remember to interplant with spring flowering bulbs for a longer flowering season. Traditionally each partition was filled with plants of one colour but you could use mixed planting and match up opposite corners or alternate partitions as long as you maintain the important characteristic of a repeated pattern. So why not resurrect the ancient art of parterres and knots as you think about changes to your garden this autumn planting season? ← Are your borders Full or Fighting?